Take some time to relax and enjoy the wonderful lifestyle this region has to offer. With renowned wineries, boutique beer breweries, award winning restaurants, kiwiana pubs, prestine beaches, nature reserves, marine parks this area is one of New Zealands most treasured destinations for locals and tourists. Our modern self contained unit provides a safe, peaceful and private place to base yourself while enjoying all the area has to offer. With the local shops directly over the road, you can purchase cafe food, great coffee, groceries, fish bait and diving equipment and petrol for your boat - all within walking distance. Snells Beach is central to the area. Whether it is walking, tramping, yoga, art galleries, or beach going - all is within just a short distance away - either by foot or by car. 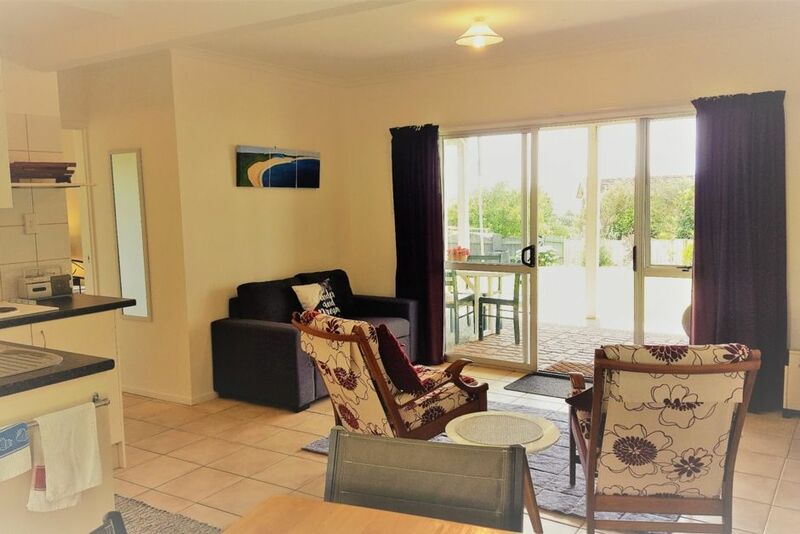 There are local taxi's for concert goers and the unit is just a 2 minute stroll to the local Snells Beach that looks out over to Kawau Island. 2 nights minimum stay throughout the year. Holiday season and long weekend tariffs may apply. Wineries, restuarants, boutique breweries, cafes, art galleries - you are spoilt for choice. Spotlessly clean and well-appointed 2 bedroom accommodation. We loved lounging on the spacious lawn in the sun. Shopping centre over the road was very handy and the cafe did a nice breakfast. The beds were a tad on the hard side but otherwise everything was perfect and Noelene was such a wonderfully kind and helpful host. Our guests were delightful to communicate with. It was a real shame we did not get to meet but we kept in touch. When we did manage to get to site we found that our guests had left the holiday unit spotless and we would recommend them to anyone. We do hope to meet with them another time. What a wee gem! Great location and set up with everything you could possibly need :) thanks for having us. Location was great - very handy to all the interesting places to see and visit in this area. Location was great - very handy to all the interesting places to see and visit in this area. Beaches handy, shops across the road. Easy to find. The location was fantastic for being able to go out for breakfast, lunch or dinner. The location was fantastic for being able to go out for breakfast, lunch or dinner. It was also very easy to find! This place was clean and tidy and had everything we needed. This place was clean and tidy and had everything we needed. Great walking distance to the beach and shops. Very cosy beds. Lovely unit, suited our small group perfectly. Lovely unit, suited our small group perfectly. Very tidy and modern, comfortable. Great location, across the road from shops and down the road from the pub/ restaurant. Close to some lovely beaches. Quiet, big garden at the front.